The current crisis between India and Pakistan began with a terrorist attack committed on February 14 by a suicide bomber from the Jaish-e-Muhammad movement in the Indian state of Jammu and Kashmir, who used a car loaded with explosives to ram a bus carrying Indian servicemen. According to the latest data, 44 people died. The Indian government immediately blamed Pakistan for the terrorist attack, emphasising the role of the Pakistani Inter-Services Intelligence (ISI), which New Delhi has repeatedly alleged controls the Jaish-e-Muhammad militants. Pakistan declared its innocence and demanded substantive evidence from India for its recriminations. On February 26, the Indian Air Force attacked targets in Pakistan with 12 Mirage 2000 jets, 4 Su-35MKI fighters which provided cover, as well as airborne early warning planes and refuelling aircraft. According to statements issued by India, three terrorist camps were bombed, including two in Kashmir and one in Khyber Pakhtunkhwa province. According to Delhi, up to 350 militants were killed and another terrorist attack which the Pakistani special services had planned to organise in India was foiled. 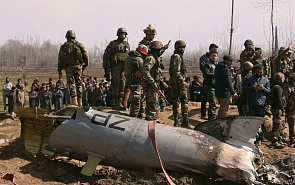 Islamabad accused the Indian Air Force of invading Pakistani airspace and promised to retaliate, while refuting information about the significant damage caused by the Indian strike. Since the morning of February 27, numerous shootouts have occurred along the Line of Control in Kashmir. At about 10 AM, Pakistani JF17 aircraft invaded Indian airspace and attacked the depots and headquarters of Indian units. Indian Air Force fighters then took off in order to intercept them, and a dogfight ensued. Both sides declared that they’d downed enemy aircraft (India claimed to have shot one plane down and Pakistan announced that it had downed two). By the evening of February 27, the loss of one MiG-21 Indian Air Force fighter was confirmed; the pilot had pursued a warplane into Pakistani territory, was hit by an air-to-air missile, ejected, and was captured. The Pakistani leadership made a conciliatory statement, calling on India to stop the invasions of the country's airspace and prevent the further escalation of the conflict. At the moment, a full-scale war scenario seems highly unlikely. Neither India nor Pakistan is interested in the escalation of hostilities, especially if it entails the use of nuclear weapons. The economies of both countries are in an active stage of development: in the event of a major war, the countries will be set back years, if not decades. A conflict involving the use of nuclear weapons would constitute a colossal humanitarian catastrophe for the two and a half billion people living in zones affected by the war, the disintegration of Pakistan as a state and foil India aspirations to claim the role of a great power. As far as the countries’ more proximate goals are concerned, it’s doubtful that either New Delhi or Islamabad could be able to achieve any meaningful objectives through limited military operations in enemy territory. Everything will be most likely limited to a low-intensity conflict: the use of air strikes and artillery strikes against enemy military positions and facilities, possibly including a limited Indian naval operation to demonstrate to Pakistan the latter’s vulnerability at sea. The aggravation of Indo-Pakistani relations was an unpleasant surprise for almost all regional and global players with interests in South Asia. China considers Pakistan a long-time ally and partner, while at the same time, relations between Beijing and New Delhi over the past year had become noticeably warmer: India views China as a key investor, whose money is needed for the radical restructuring of the Indian economy. The US is interested in a rapprochement with India, which Washington regards as a potential ally against China; at the same time, it cannot afford to fully accept the Indian position, since the main supply route of the American contingent in Afghanistan is through the territory of Pakistan. Russia, which is a particularly privileged strategic partner of India, is at the same time not interested in breaking off relations with Pakistan, which is an important regional player, influencing the development of the situation in Afghanistan. In addition, the conflict between India and Pakistan threatens the work of the most successful regional project – the Shanghai Cooperation Organization (SCO), where India and Pakistan should theoretically cooperate, including in the fight against terrorism. In general, we can say that the sources of the current Indo-Pakistani crisis are purely internal. Neither New Delhi nor Islamabad has appealed to other countries for mediation. In this situation, the only thing left for Russia, the United States, the People's Republic of China and other external players to do is to call for restraint and the de-escalation of the conflict, and try not to aggravate the situation with thoughtless interventions.